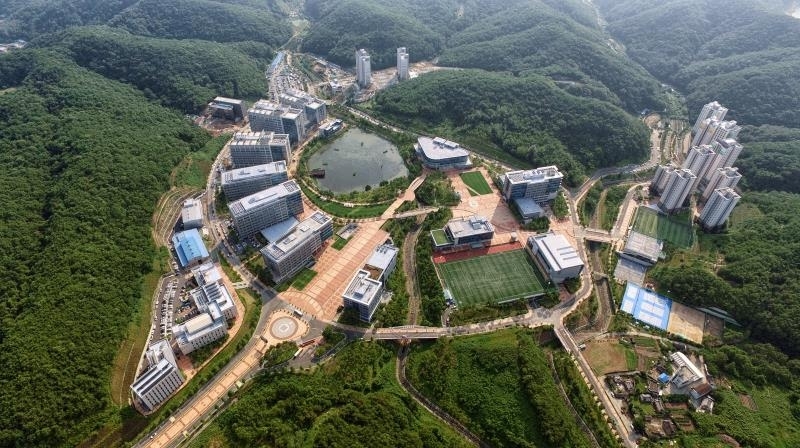 An aerial view of the UNIST campus after completion of the 2nd BTL construction. First year anniversary celebration set for September 30, 2016. Bringing on the K-Science craze through the export of potential research. A celebration was held on September 30 to mark UNIST’s first year anniversary as a government-funded research institute. This was also to commemorate the successful completion of the second phase BTL project for the expansion of its research space. The anniversary reflected on the excellence and achievement of UNIST and will be a foundational building block for its work in the coming years. In fact, the citation rate of Highly-Cited Papers (HCPs) for UNIST has reached the number one spot in the top universities ranking compiled by Korea Institute of S&T Evaluation and Planning (KISTEP). This assessment was based on 2010-2014 publication and citation data. Moreover, UNIST has made its mark on the world stage, ranking among the top 100 universities internationally in the the Nature Index 2016 Rising Stars, published by the prestigious journal Nature. The Nature Index 2016 Rising Stars supplement identifies the countries and institutions showing the most significant growth in high-quality research publications, using the power of the Nature Index, which tracks the research of more than 8,000 global institutions. To celebrate this milestone year, UNIST will provide free lunch at all campus cafeteries on September 30, from 11am to 2pm throughout the campus.